For those who were participating in the College Times Treasure Hunt, it's over! The $1000 certificate was found yesterday, near Hunt's Pyramid at Papago Park in Phoenix, by a 20 year old Scottsdale Community College student. Clues for the Treasure Hunt were printed in each edition of College Times, but you could sign up to receive clues early by text. Before the treasure was found, seven clues were released by text, plus a bonus clue was available by visiting the College Times 'street team' at ASU. I think you could also get bonus clues by following College Times on Twitter and Facebook, but I didn't do that. Perhaps I should have. My family was searching by Tempe Town Lake since the clues referred to 'water northwest of ASU'. We weren't even close! While the chance of finding the $1000 loot was slim to none, we had a great time looking. It's fun the whole family can enjoy and good exercise too. It's also a great excuse to get out of the house, go places you normally wouldn't go and see parts of the Valley you may not otherwise see. While at Tempe Town Lake searching for the 'treasure', my family ended up pedal boating on Tempe Town Lake as the sun went down. After that, we walked down Mill Avenue and found a great little Turkish grill where we ate dinner. Our college-aged daughters probably wouldn't normally want to hang out on Mill Avenue with my husband and I. But they made an exception in this case, and we all enjoyed ourselves! Times Media regularly has similar treasure hunts in the Valley. Interestingly, I just found this old post on a 2007 Times Treasure Hunt where the treasure certificate was found in basically the same place - under a rock at Hunt's Pyramid. Except back then, the prize was $3000 instead of $1000. Parade recently had an article listing ten technological advances to home appliances that could be in our houses by 2025. From biometric vitamin dispensing faucets to a food disposal that dispenses compost pellets, some of these futuristic appliances are pretty cool while others seem a little creepy. Personally, I don't think I want a computerized medicine cabinet dispensing medications to me. But I could definitely get used to a washing machine that washes, dries and stores my clothes for me, and then irons them when I'm ready to wear them. And I can't wait to have a 3D printer in my house! I hate going to the grocery store, so I love the idea of shopping on a smartphone and having it delivered. I'm honestly a little surprised that grocery stores aren't already using the internet more effectively. Most grocery stores have those 'rewards' cards you sign up for to get discounts. They scan your card every time you shop, thus tracking everything you buy. So they know exactly what you buy and how often you buy it, and they have your contact information. I wonder why they don't periodically email me a reminder shopping list of stuff they think I'm out of? I get emails telling me when I need to buy a new toner cartridge for my printer (although they're usually wrong!). Grocery stores could email you a 'proposed' grocery list, then let you login to edit it and schedule delivery. They could use a smart app that 'learns' your habits and refines your preferences each time you shop. That way, you could quickly and easily re-stock on all the items, brands and quantities you normally buy without having to go to the store. But then people might not make all those impulse purchases, buying stuff they don't need just because it looks good. Perhaps that's why grocery stores don't do this! I'm getting so sick and tired of all the political and media talking heads calling for more gun control because of one nutjob. The average American is much more responsible with their weapons than the government is. #FastAndFurious. Just like the average American is more responsible with their money than the government is. #FiscalCliff The fools in D.C. still think they can spend their way out of debt. If not for a gun, the (unworthy of being named) loser in Connecticut would have stabbed a bunch of people or he could have made a bomb out of common household products and killed even more people. All the laws, security and precautions in the world will be breached if someone is determined to be evil. Gun control only disarms honest people and then only the bad guys will have guns. I was driving through Chandler today and this business caught my eye. 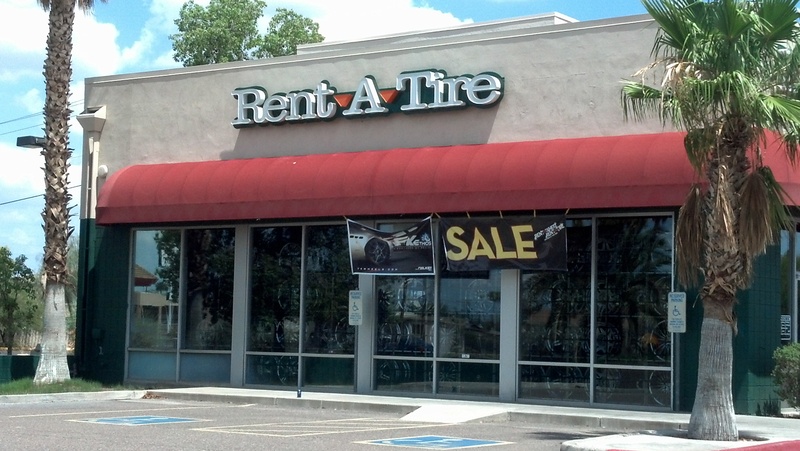 Is the economy really so bad that people have to rent tires? I can't imagine a single situation that would make me want to rent a tire. Even if you need new tires really bad but can't afford them, there are many used tire places around the Valley that sell decent used tires for half the price of a new tire (or less). Since I'm a very curious person (or weird, however you want to look at it), I couldn't stop wondering what would make somebody rent a tire. So I googled this place. Their website claims that they're the "largest Rent-To-Own Custom Wheel and Tire Retailer in the nation". I'm sure they probably are because I think they may be the ONLY Rent-To-Own Custom Wheel and Tire Retailer in the nation! But here's what surprised me... their website says they have over 86 stores across 11 states, and the company is the 7th largest independent tire dealer in the country. Seriously, who rents tires? Apparently not many people. Although, the store was open and they had a "Sale" sign out front, there wasn't a single car in the parking lot. PHOENIX (Wednesday, August 15, 2012) -- Attorney General Horne announced today two lawsuits have been filed against Arizona companies selling mortgage modification services to distressed homeowners. The lawsuits are against Phoenix based Making All Homes Affordable, LLC (“MAHA”) and its owner Albert Figueroa and Tucson based La Paz Source, LLC, its owners, Defendant Maria Beltran and her husband, Defendant Francisco Ramos and their new operation La Placita Multi Services, LLC owned and operated by Beltran and an individual named Arturo Gomez Leon. Continue reading "Beware of Mortgage Modification & Foreclosure Assistance Scams"
If you're looking for a unique property in the West Valley with a large lot, check out this Glendale, AZ house for sale! This house is listed by one of my favorite AZ Realtors, Danielle Dror of Phoenix View Realty. You have to see all 33 pictures of this one-of-a-kind house! Property Description: Exceptionally unique property. Located in the heart of Glendale, hidden in a quiet subdivision is this earth sheltered home that sits on more than an acre. The main house has 3 bedrooms with 2 baths and is energy efficient. The property is completely landscaped with desert trees, plants as well as citrus trees. There is a 1700 sf detached garage with it's own bathroom. The office behind the house is a well kept secret and a great place for a small home business. With a little remodeling, it could be a guest house or in-law suite. Appointments are a must if you want to see the office space. You must come and check it out. Click here for more pictures and additional information! More information about this house! The other night, it got so windy that it blew a lawn chair in my pool. It also blew a million leaves and some of our landscaping lights in the pool. Where are my teenagers when I need them? Gotta love Arizona monsoons! Here's a question for all the commercial real estate agents, brokers and developers out there. Why do commercial real estate developers always put these bumpy landscape tiles right by grocery store entrances and exits? There must be a good reason because all the major grocery stores have these. But they're such a pain because stuff starts falling off your cart as soon as the wheels hit these things. If you try to go over them slowly, the cart's wheels get stuck. If you try to go over them quickly, your cart bounces around and stuff falls off.